Some have suggested that my husband and I have sheltered our children. I cannot deny the fact that we intentionally made decisions to shield our kids from potentially harmful situations or incidents that would negatively impact the foundation we were trying to provide them. I am not just talking physical circumstances but emotional, intellectual, and spiritual, as well. We worked hard not to expose them too early to specific experiences where the visual scenes would forever plague their memory. Often — I mean very often — my children did not participate in activities that were commonplace for other children. Now, any parent with more than one child knows that each child needs to be treated differently based on the kind of kid they are. A child’s aptitude for responsibility, patience, intellectual curiosity, moral development, and other characteristics must always play a part in what is allowed for one child and maybe not the other. With that said, our allowances were rarely adjusting down, but instead, some of our children waited longer for a privilege to be obtained. Some of the more simple examples of our “sheltering” would be not allowing our children to sit in the front seat of the car until they turned 13 and believing that PG-13 did mean PG-13. It included not letting our children own a cell phone until they were at least midway through their freshman year of high school and deciding that dating as a couple was a potential privilege at 16. We don’t have cable — or television in their bedrooms, ever. If they went out in the evenings to a friend’s house, we called the parents, and on dance nights, they were prohibited from spending the night with friends of the opposite gender. Most importantly, Sunday Mass was never trumped by anything or any situation, and prayers we say at home, like grace before meals, were prayed no matter where our family found itself. Indeed, these are just sort of guideposts for our children, but one can get the idea of what it is like in our household. Now we did not allow our children to participate in scenarios that were life threatening, like walking in a dark alley late at night, but we did see great value in exposing our children to people from all backgrounds. Opening our children to make a connection with individuals who live differently than us was essential to their healthy development and their call to be disciples. We discussed worldly events, whether exciting, disappointing, or sometimes dangerous, so that they might hear a different side than what would otherwise be shared in the media. As a family striving for faithfulness, we were careful to share the good and beautiful about our Catholic faith and the ugly and truthfulness of the human failing of our church as well. We welcomed others in our home that came from other faith traditions or no traditions at all. We explored the differences and were able to articulate why we knew that Jesus was indeed the way, the truth and the life. Often, when others commented that my husband and I sheltered our children, the remark was not intended to be flattering. The perspective was frequently critical, with the potential of encouraging us to be a bit more “progressive.” Perhaps we are stubborn, but their comments had little if any impact on our ways of parenting. I share this because during this past year, I encountered three different individuals, unknown to each other, who as I got to know them better, came from what I would call a “permissive” sort of upbringing. Each of these people were young adults in their mid-twenties. In different ways, they shared that their parents essentially allowed them to make their own decisions on faith and morals. All three of them were obviously still alive, but they had fascinating and yet risky life encounters. From my limited perspective, it appeared they were paddling through life, but their oars were not rowing in any particular direction. I think our culture would say these twentysomethings were not sheltered as children. Yet through lengthy discussions, I found a very interesting common denominator between all three individuals. They each heard the name Jesus, and they knew the Bible was a book, but they claimed not to know anything about either. Of course, upon my discovery of this information, I was blown away. I would not have been so perplexed if they didn’t believe in who Jesus was or what the Bible teaches, but not to even know anything about them was mind-boggling for me. The most excellent story of all time is the story of our salvation through Christ, and they never heard it. Our Savior’s arrival was significant and changed the course of history, not just for believers but for all of humankind. Every person that is granted formal education has a right to know this information. My initial reaction was, “How can our society not believe children are overly protected if they have been denied the opportunity to know who Christ is and what the ‘Good News’ is all about?” Therefore, I am pretty confident these individuals were sheltered, because in all three situations I had the privilege of sharing the truth of Christ and observing their reaction. In each of these cases, these young adults wanted to know more. They were overwhelmed by a desire to pursue a more in-depth understanding, and they were perplexed by the fact that this reality was withheld from them. From my standpoint, how is denying a child the knowledge of Christ not considered by our culture as sheltering a child? In a few short weeks, we will be blessed with the reminder that Lord came and changed the course of history like no other event before or since the birth of Christ. As faithful, we need to take to heart the gift that someone did not shelter us from this truth. Sadly many young people have been poorly served by parents who believe they are being “progressive” to withhold the greatest story of all time from their children. I will gladly claim the title of being a “sheltering” parent if those who give me that label include the information of our willingness to share the truth of who Christ is and what he has done for every person who was, is, and will be. Merry Christmas to all, and tell everyone who has not been gifted with the story of Christ, the truth of existence, even if you will be persecuted for doing it! I like to bring humor into classes I teach and homilies that I preach, because I think humor is a good way to get through to people about the importance of faith. As I look back on my ministry I remember many times when certain points of humor were particularly well received; one was several years ago, right before Mass started at my parish of St. Joseph’s in Gnesen (the prettiest parish in the Diocese of Duluth, if you ask me). St. Joseph’s is a small, rural parish, so there tend to be other critters in the area besides humans. It was during Advent when someone inadvertently allowed two dogs to sneak in the door. They were good-sized dogs, and they ran up and down the aisle of the small church, which caused a bit of a stir with the parishioners. After the dogs were finally corralled and let out, I told the congregation that I can tell Christmas is getting near, because I hadn’t seen those two dogs since Easter. The crowd loved it. The point, of course, was not to call holiday Mass-goers dogs but to make light of the unfortunate reality of so many people who only go to Mass once or twice a year. The church has to be able to meet people where they are in their faith journey, and as Mary Poppins said, “A spoonful of sugar makes the medicine go down.” All faithful Catholics need to be welcoming, loving, and open to our brothers and sisters whose faith is weaker, and this is especially the case for me and my brother priests. Our primary objective should never be to shame the people who come only during the holidays; our primary objective should be to make sure they come back next weekend and the weekends after that. We, as Catholics, have the greatest thing going; we have Jesus Christ in the Eucharist, and our desire should be to make sure that is shared with our fellow Catholics. Granted, outside of family and friends other personal circles, most people do not have the opportunity to influence people. This is where the “threading of the needle” comes in for us priests. For many years I have admittedly done this poorly. At the end Christmas and Easter Masses, I would tongue-incheek announce the weekly Mass times as a unsubtle hint to the infrequent attenders. I would do this with an unfortunate tone that only the regular Mass attenders would find humorous. This sort of approach never achieved the true desired outcome, which was getting these folks to come to Mass more often. Recently I have still been addressing it, but in a much more upbeat and welcoming way, and sometimes I still announce our Mass times! But it is all in the tone, and I have to admit that it has been working. Over the past few years, I have had small numbers of people come back after my invitation, which has been the point all along. This problem of the infrequent Mass goers is far from being only an American problem. Pope Benedict XVI, while he was cardinal, addressed the phenomenon in a book-length interview by Peter Seewald. In the book, titled “God and the World,” the future pope said this: “I have nothing against it, then, if people who all year long never visit a church go there at least on Christmas night or New Year’s Eve or on special occasions, because this is another way of belonging to the blessing of the sacred, to the light. There have to be various forms of participation and association; the Church has to be inwardly open” (442). So this coming Christmas Eve, when you see someone in your spot in the pew who you vaguely remember from last April, don’t get upset with them. Welcome them, and if you have the courage, invite them back to that spot next Sunday as well. Craig and Lori Norrell already had three children who were all in their pre-teen or teen years. Life was good. But Lori had a deep sense that God wanted more for them. She started praying for Craig to be open to reversing his vasectomy, as she was sure God had greater desires for them as a family. Then Craig went on a retreat during the spring of 1998. Lori prayed for him the whole time; in fact, she had been praying for seven years that they would somehow miraculously have more children. It was during this retreat that Craig’s heart was touched by God to reverse the decision he had made, and, knowing he was being called to be faithful to God, Craig followed through. After a year of saving money (insurance won’t pay for a reversal) and being told multiple times by his doctor that the reversal only has a 50 percent chance of success, Craig reopened his life and his marriage to the possibility that God’s heart may have more children in mind for them. One year later, with great joy, Brianne was born, and Mallory followed within the year — Irish twins as they say. Neal was born six years later. It is their story as a family, which includes their three oldest (Ryan, Candice, and Kyle), that I am inspired to share with you. 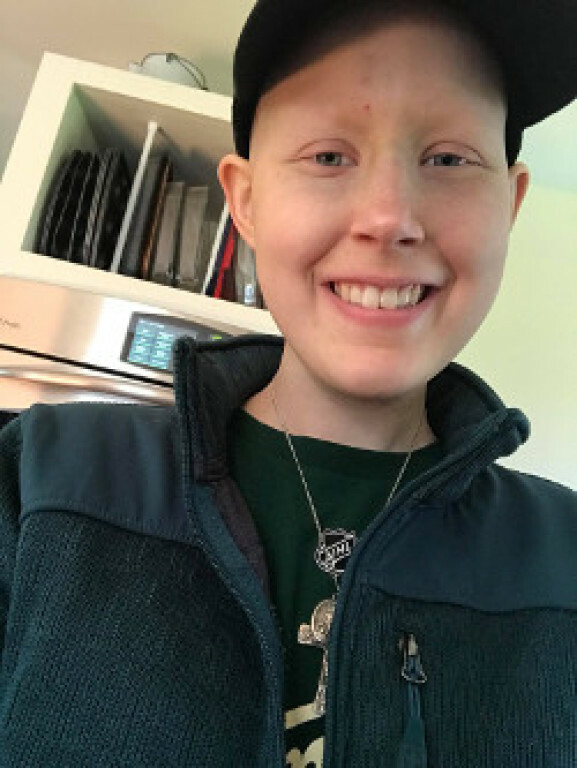 You see, as I write this, it was one year ago yesterday (Nov. 7, 2017) with her family, medical team, and four beloved priests around her praying the Hail Mary, that Mallory, at the young age of 16, gently went to the loving, heavenly embrace of her Savior after a ten-and-a- half-month battle with cancer. Their entire story all seems so heroic and dramatic to me. And indeed, it is. I’m not talking about a drama like Hollywood, but a Passion-of-Christ- like drama. One of trust, tragedy, and redemption. Yesterday, Nov. 7, the Norrell family and I gathered with some of Mallory’s friends at her gravesite in Embarrass. We prayed a Chaplet of Divine Mercy, read Scripture, and told a few stories. Mallory loved all three of those things, as she was a fun, loving, and holy kid … who faced both life and death with Jesus. I often think of how much St. Peter would have missed out on if he had not abandoned himself to fully following the Lord: walking on water, witnessing and performing miracles, the crucifixion, Easter morning, being crucified in Rome. He would have been spared the agonies but missed the beauty. Craig and Lori Norrell, and their family, are a witness like St. Peter. They could have been spared the agony of experiencing the death of their beloved daughter and sister but would have missed the beauty of a saintly young woman. They chose life, and indeed life has been given! Mallory Norrell lived this in a way that has evidence to say she is a true Servant of God. This deep, abiding, heroic trust in Jesus is a grace God gave her through her parents’ deep and abiding trust in Jesus. There are so many good, holy families living in God’s loving will. You experience the fruit of his abundant love daily. Thank you! You, like the Norrells, bear witness to the generous Mercy of Jesus. I believe stories like Mallory’s and her family need to be shared more often. So, I decided to share it with their permission. The dream of Mallory has been in the heart of God for all eternity. I am so grateful Craig and Lori allowed the dream in God’s heart to come true and be shared with us all. We are so grateful for Mallory. 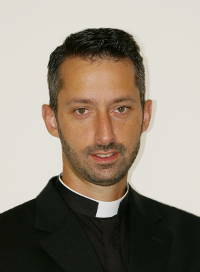 Father Ryan Moravitz is vocations director for the Diocese of Duluth and pastor of St. Lawrence, St. Joseph, and Holy Family in Duluth. Father Michael Schmitz: What does it mean for something to be blessed? I recently became Catholic and keep hearing about all of the stuff you have that is “blessed.” Someone even gave me a holy card that they said had been blessed. I like the idea, I just don’t know what it means for something to be blessed. I am glad that you are asking this question. Even though you haven’t been Catholic for very long, you know that it is good for Catholics to ask questions. In this case, your question is one that not a lot of Catholics even know about. Hopefully this response will not only help you, but them as well. In the Old Testament, God calls His people to be holy, or he tells them that the Sabbath day will be “holy unto the Lord.” This particular sense of holiness highlights the “otherness” of someone or something who is blessed. It is no longer ordinary but has been “set apart.” If we stop for a moment and consider what it meant for Israel to be holy in practical terms, we quickly see that it means that they had to be different. For God’s Chosen People to be “blessed” or “holy,” it would mean that they couldn’t just live like everyone else and they couldn’t just look like everyone else. They would have to conduct themselves differently. This is one of the reasons the People of Israel had so many unusual laws governing what they ate and what they wore. They were set apart, and this meant that they had to live the blessing — they had to live differently. Now, to be “blessed” did not merely mean to be “set apart.” It meant to be set apart for something. There is no virtue in simply being different. Israel was holy because it was set apart for the Lord. To be blessed (or to have an object blessed) is to be set apart for a purpose. Another way to word it: to be blessed is to be set apart for God’s purposes. It is not simply to be “removed from use,” but to be “elevated to a higher purpose and use.” You could also think of the term “consecrated.” In this sense, you could see how certain people or things were “consecrated” for a purpose: how Samson and John the Baptist were both consecrated from the womb, or how the altar in the Temple was consecrated for the worship of God. When we bring forth an object or a person to be blessed, we are presenting that person or thing to God so that (by the power of the Holy Spirit and the invocation of the Name of Jesus), they would be set apart for God’s purposes. For example, many people will ask me if I can bless their cross on a chain or a bracelet. When they bring it to me, it is merely jewelry. But after it is blessed, it ceases to be jewelry that is nothing more than an accessory to one’s outfit: that object has been set apart for a purpose. It will still be worn like jewelry, but the purpose for which it is worn has been changed, because the object has been consecrated for a higher purpose. In the case of the cross around one’s neck, the higher use is that it will, from then on, only point to Christ and his saving death and resurrection. Think of part of the Mass on the feast day of Saint Blaise. On that day, faithful people show up and have their throats blessed. The prayer reads like this: “Through the intercession of Saint Blaise, bishop and martyr, may God deliver you from every disease of the throat and from every other illness: In the name of the Father, and of the Son, and of the Holy Spirit.” It is a prayer for protection and healing. But consider this: for a thing to be blessed is for that thing to be consecrated for a purpose. All of those who present themselves (and their throats) to be blessed are essentially offering their throats to be set apart for God’s purposes. I like reflecting on this and being reminded that I must use my throat (my voice) for God’s purposes only. If my throat has been blessed then it is no longer merely “my throat,” and I cannot use it however I want; I have to use it to point to Jesus and his saving death and resurrection. In politics today, people have fallen into the habit of condemning the evil in other persons, groups, structures, or oppressor classes, while they themselves embrace the role of victim. It is hard to see a way out of our current predicament, other than a new Great Awakening through a tremendous outpouring of the Holy Spirit. Who would know better about having ideological enemies than the Russian writer Aleksandr Solzhenitsyn (1918- 2008)? He spent seven years in Soviet labor camps and three years in exile before being exonerated. Though Solzhenitsyn was steadfast in denouncing the destructive ideology of the Soviet regime, Solzhenitsyn knew he could not succumb to personal hatred of individuals. He wrote: “It is impossible to expel evil from the world in its entirety, but it is possible to constrict it within each person.” Solzhenitsyn reminds us that the struggle for justice in our world is won or lost in the soul of each person. Despite the evil inflicted upon him by others, he knew that the battle against evil for which he was most responsible was the one within his own heart. The same is true for each one of us. Our culture views social relations increasingly through a victim-oppressor ideology, and we all have been conditioned to see ourselves as victims of some enemy class that seeks to impose its evil worldview upon us. This trend can be seen on both sides of the political spectrum. One side blames an assortment of alleged bigots and status quo seekers — corporations, Christian nationalists, members of the patriarchy, and white people — for the oppression of pretty much everyone else. Meanwhile, the other side demonizes those branded as subversive elites and infiltrators: Marxists, Wall Street, multiculturalists, Hollywood, Muslims, immigrants, and the media. Each group’s hatred for its supposed enemies is palpable; even worse, one is guilty by association — all Republicans are misogynist white supremacists, and all Democrats are anti-American communist enemies of the people. There is, of course, a certain comfort in this approach, as it is certainly far easier to condemn the wicked “out there” than to recognize both our own sinfulness as a cause of social disorder and a concurrent need for transformation. But this growing hatred cannot end well. Coupled with the lack of civil debate and discourse, it will likely end in more bloodshed — some of which we’ve already begun to see in the Charlottesville violence; the mass shootings in Charleston and Pittsburgh; separate shootings that targeted congressional Republicans and the conservative Family Research Council; and in the clashes caused by the “Antifa” (anti-fascist) groups. Note the implications of Mrs. Clinton’s comment: our political opponent is evil and out to destroy all good things; we, on the other hand, have chosen the path of righteousness, and are oppressed by the powers-that-be because of it. This kind of rhetoric is a continued recipe for more divisiveness, hatred, and violence. This does not mean we need to accept harmful, violent, and racist ideologies. In fact, we have the responsibility as Christians to confront them. But we must always see things through the lens of a broken, sinful, and hurting world, recognizing that “all have sinned and fall short of the glory of God” (Romans 3:23), especially and including ourselves. There is no true justice where God is not worshipped. There is no order in the state or in society when there is no order in the soul. As Catholics, we can begin to mend the fractures so prevalent in today’s politics by reaching out in civic friendship to our newly elected officials, whether we voted for them or not. You can find out who your newly elected officials are by calling (651) 296-2146 or visiting www.leg.state.mn.us. Reaching out to your elected officials may seem daunting or even unpleasant, but it doesn’t have to be. By attending Catholics at the Capitol, the Minnesota Catholic Conference will equip you to take the first steps in building these important relationships. Join 2,000+ Catholics on Tuesday, Feb. 19, 2019, for this day of prayer, inspiration, education, and advocacy. You’ll hear from incredible witnesses who live out the faith in public, including actor Jim Caviezel. You’ll also be equipped to speak with your legislators about current issues affecting life and dignity. Space is limited for this impactful day, so don’t delay! Bring your friends, family, and fellow parishioners. Get tickets and select your transportation option by visiting www.CatholicsAtTheCapitol.org. We’ll see you in St. Paul on 2.19.19! While the proposals that had been put forward may have needed refining, Bishop Sirba felt they were solid, and he had been in “full support” of them. What’s more, the bishops were bringing to the meeting the fruit of having dialogued with the faithful in their dioceses. “I had had opportunity to listen to the priests and their concerns and our deacons and their wives and their concerns and numerous of the lay faithful who have expressed a desire that we take action, strongly and firmly,” Bishop Sirba said. But he also knew something else. “I pledge obedience to the Holy Father, as well,” he said. So he took the moment as an opportunity to step back and consider how to remain open to the situation. That seems to have been aided by what Bishop Sirba described as a “very powerful prayer experience” on the first day of the meeting. Included in that prayer experience were testimonies from victims of clergy sexual abuse, which the bishop described as powerful both for what was expressed and for the people who expressed those things, who remain practicing, fervent Catholics. The bishop said he remains in favor of the revised proposals Cardinal Daniel DiNardo, president of the USCCB, is taking to the Vatican meeting. Another stunning moment of the November meeting came when the bishops attempted to vote on a statement supporting the investigation into disgraced former Cardinal Theodore McCarrick, who is accused of sexual abuse of both minors and seminarians. After debate over the wording, the measure was voted down. He suggested the unusual way the measure came to the floor, with language being drafted by hundreds of bishops, bogged things down and contributed to the vote. The meeting’s outcomes produced a major uproar, and Bishop Sirba said he understands it. And without taking away anything from what the church needs to do to fix these serious problems, he said one response of everyone should be a recommitment to the call to holiness. We have become accustomed to instant answers and ready responses. Just say, “OK, Google.” Except, of course, when there aren’t any. Sometimes we are deprived of support, stressed by the unfairness of a situation, and uncertain about what to do next, and no simple answer is available. In faith, then, the soul is given the choice of the long view and the ultimate promises held out to us by God. We practice the theological virtues of faith, hope, and charity. We trust in God. Some answers will be given only in heaven. Advent waiting is an opportunity for us to enter into the mystery of the ways of God. Along with the prophets of old and contemporaneously with our fellow travelers on the pilgrimage of faith, we seek God and look forward to His return in glory. The “Hid Divinity,” to use a term coined by Dionysius the Areopagite in the early Church in connection with the Nativity of Jesus Christ, we meditate on the reality of religion that the most important things in faith come to us in disguise. The God of heaven and earth comes to us as a baby in swaddling clothes, as a prisoner hanging on a cross, as a piece of unleavened bread. Why? Couldn’t our salvation have been worked out in another way? We believe this is the best way because it is the way God chose to do it. Holy Mother Church offers us the days of Advent to reflect on and enter into the mystery of salvation history. Like the Blessed Virgin Mary, we ponder truths that we cannot fully understand. With God’s grace and a lived faith we can penetrate the truths of our faith more deeply, it is true, but the mystery of God remains. Our little human minds cannot comprehend God. Set some goals for yourself this Advent. Ask God to give you the grace to celebrate the season well. Pray that God will bless you and your family and help you to enter into Christmas with joy. Schedule time for silence. Just as we make doctor’s appointments, plan shopping sprees and pickups and drop-offs, so we can schedule a few moments of Advent silence. Set aside an hour of Eucharistic Adoration, commit to coming to Sunday Mass a few minutes early, pray with your family using Sacred Scripture, and pause for a few minutes of silence after reading passages from the Old Testament or New that tell of the Good News of the coming of Jesus. Go to confession. Our parishes add additional times during Advent for the celebration of this great Sacrament. St. John the Baptism challenged the people to prepare the way of the Lord by clearing a straight path to their hearts. We as Catholics prepare by going to confession. “The whole power of the Sacrament of Penance consists in restoring us to God’s grace and joining us with him in an intimate friendship” (Catechism of the Catholic Church 1468). Reach out in love to a neighbor. Examples abound, and opportunities are endless. Try to be open about your faith and why you find joy in Christ’s love and mercy this Advent. Invite someone to Mass or RCIA. Especially be mindful of the poor. “When a profound silence covered all things and night was in the middle of its course, your all-powerful Word, O Lord, bounded from heaven’s royal throne” (Wisdom 18:14-15). 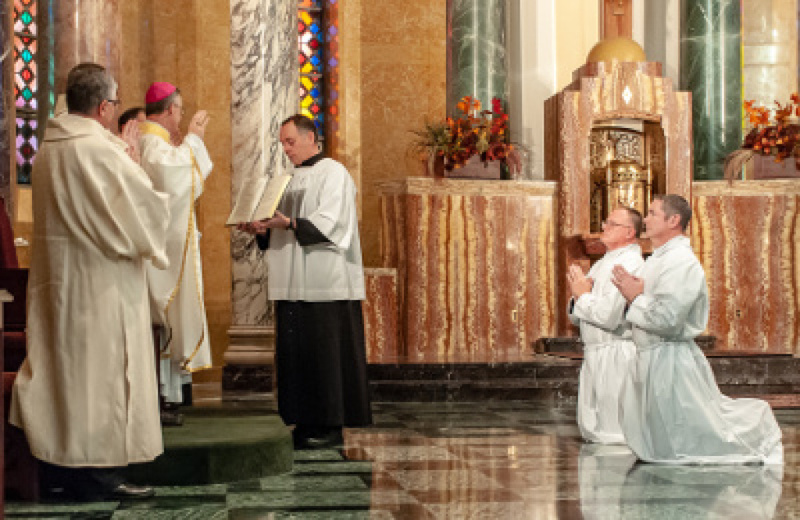 Bishop Paul Sirba ordained Steve Schuler and Chuck Welte as deacons at the Cathedral of Our Lady of the Rosary Nov. 25, the Solemnity of Christ the King, before a large congregation of family, friends, and other faithful. Both are transplants to northern Minnesota. Deacon Schuler, a retired law enforcement officer, and his wife Sue have two sons and live in Grand Rapids, where he will serve St. Joseph parish. He also will serve St. Augustine in Cohasset. Deacon Welte and his wife Lynn own a grocery store in the Brainerd area and have five children. They are from Immaculate Heart Church in Crosslake. He will also serve St. Emily in Emily. Deacon Schuler grew up in a farming community in central Iowa and first came to northern Minnesota for family vacations, and he fell in love with the lake country. “After high school, I moved to northern Minnesota in the Walker area,” he said. God didn’t play a big role in his life at the time, but when he met Sue, a Catholic, that began to change. He attended RCIA and was baptized and confirmed before they were married in 1979. Even then, through 27 years working for the Minnesota State Patrol, he says he “didn’t give Jesus a lot of time” while raising a family and pursuing his job and other interests. But that changed upon his retirement in 2012. He joined a Catholic book club and did Bible studies and started reading Catholic books, and he returned to confession after many years away. He says in part he was challenged by his son, Daniel, who is discerning a call to the priesthood with the Carmelites in New York. With some prompting by the late Deacon Jim Sura and with “prayer, discernment, time, [and] patience,” he discerned that God had a call for him in diaconal ministry. “I just had to get out of his way, surrender myself to him, and trust in him,” Deacon Schuler said. “The Lord has blessed me an empathetic, compassionate, and loving heart,” he said. He says he has already found “humbled enjoyment” bringing Communion to hospital patients, those in assisted living and nursing homes and to the homebound and is looking forward to assisting his pastor in other needed ministries. He and Sue also teach RCIA, adult faith formation, and marriage preparation. Deacon Welte lived in Rockford, Illinois, until he was 12 years old and then lived in northern Wisconsinn until his senior year in high school, when his family moved back to Illinois. He studied aerospace engineering at the University of Minnesota, where he met Lynn. 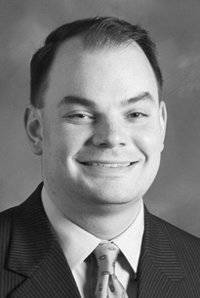 His career path took him into the Air Force and then into working as a contractor intelligence agencies, living in West Virginia and commuting to Washington, D.C. He also earned a master’s degree in telecommunications and computers. “But something was missing,” he said. His diocese in West Virginia had a deacon program, but the time wasn’t right, and then the diocese didn’t run the program after the first group. “I was secretly relieved, because I was starting to feel a call from God regarding the diaconate, but I didn’t want to have to make the choice to pursue it,” he said. But soon after, he visited Minnesota and met with Deacon David Craig, who was then director of the deacon program for the Diocese of Duluth. Deacon Craig invited him to consider coming to Minnesota if he was serious about entering the program. “As improbable as it sounds, 16 months later we were moving back to Minnesota, having bought a grocery store, and 16 months after that I entered formation,” Deacon Welte said. He said God has blessed him with gifts of service and teaching, reflected in 10 years of teaching conformation and years of working on mission projects in the Appalachians. But one of the things he’s learned in formation is to “love what the will of God has called me to do.” By doing that, he believes he will serve the people of the diocese even in the midst of challenging times for the church. The two new deacons begin ministry in their parishes immediately and continue their formation until spring. When you read this, the 2018 elections will have passed. The anger will continue to boil, and new opportunities for outrage will undoubtedly abound. The demonization of political opponents will persist, and the saddling of the American presidency with criminal investigations and threats of impeachment will likely become a permanent feature of our politics. Yet, whatever the designs of Providence for the American republic, we know what Catholics must continue to do to foster moral and civic renewal: participate in the public arena as faithful citizens, embodying Pope Francis’s reminder that politics is one of the highest forms of charity because it serves the common good. In short, we must be true friends to our elected offi cials and our fellow citizens. But the church proposes a different idea of politics — one that goes back to the ancients. Politics comes from the Greek word polis, meaning “city.” Some of us live in the polis of Minneapolis, for example. Politics, the communal process of deliberation within the polis, was not a wrestle for control; it was fi rst and foremost a task of friendship. This friendship shared among citizens was shaped by the pursuit of virtue — and this made it possible for citizens to come together as equals to deliberate how they ought to order their common life in pursuit of the good. The church embraced this understanding of politics, identifying its proper purpose as the pursuit of the common good. Yes, political debates can get heated because important issues are at stake. Our battle for justice and the common good, however, is not against people, but, as St. Paul reminds us, against the powers and principalities (Ephesians 6:12). It is a spiritual battle. That is why Cardinal Robert Sarah could say in a recent speech that “A Christian does not fi ght anyone. A Christian has no enemy to defeat. Christ asks Peter to put his sword into his scabbard. This is the command of Christ to Peter, and it concerns every Christian worthy of the name.” This is an important lesson: in politics: We may have temporary opponents, but we must never mistake them for permanent enemies. Our discourse has become so coarse, and so much anger fl ows through our nation, because our horizons have become political rather than eschatological. When there is no ultimate justice meted out by God, we look for politics to bring it about. And it cannot. Hence, when we place our hope in princes, we will always be disappointed. And that is where the cycle of anger and political decay begins and sets in. Christians must model a different way: a model of friendship. Just as any good apostolate must be rooted in relationship, fostering friendship with others through friendship with Christ, faithful citizenship is no different. We must reach out to both our elected offi cials and fellow citizens in friendship, offering ourselves as resources and as friends in the important conversations about how we ought to order our lives together. Sometimes we will disagree, and that is okay. But disagreements need not lead to division or demonization. Sometimes, people will see us as enemies, and some will even persecute us. But politics lived as true friendship will change hearts, build stronger communities and undo the knots of division and resentment plaguing our communities. How does one begin? The bishops of Minnesota created Catholics at the Capitol and Capitol 101 events as a way to grow in faithful citizenship and civic friendship. Through these opportunities, Catholics are formed and sent to be true resources — friends — to their elected offi cials and communities. The next Catholics at the Capitol event takes place in St. Paul on Feb. 19, 2019. Join over 2,000 Catholics in a day of education, inspiration, prayer, and advocacy. Grow in your knowledge and courage to be a faithful citizen! Join your voice with others to bring a Catholic perspective on issues to our state Capitol. Tickets are now on sale! Visit catholicsatthecapitol.org for more information and to register. Space is limited; register early! “If one part suffers, all the parts suffer with it; if one part is honored, all the parts share its joy” (1 Corinthians 12:26). St. Paul established a Christian community in Corinth about the year 51. The city, a major seaport and commercial crossroads, struggled with issues of moral depravity, factionalism, questions of leadership, and other cultural woes that spilled into its celebration of the liturgy. St. Paul courageously responded to issues of conscience in the light of faith in Jesus Christ — there really is nothing new under the sun. As a church we are facing numerous challenges in our own day. Foremost is dealing with the clergy sexual abuse crisis. For years we have been dealing with the painful consequences of the sins surrounding the sexual abuse of minors. Our priority has been to bring healing to those who have been hurt and to do all in our power to prevent this sin from happening again. Like you, I want the truth to come out in all the levels of the church, so that we can respond accordingly in the light of the Gospel. Our Catholic faith teaches that we will all ultimately be judged: “For we must all appear before the judgment seat of Christ, so that each one may receive recompense, according to what he did in the body, whether good or evil” (2 Corinthians 5:10). There is ultimate justice. Now is the time of mercy. Recently the priests and deacons of the Diocese of Duluth gathered for our annual Clergy Conference in Grand Rapids. Our topic was the Patristic age of the Church. We devoted time to our need for ongoing intellectual formation. Benedictine Father Denis Robinson, the rector of St. Meinrad Seminary in Indiana, was our presenter. Among the many themes he addressed was the tension that exists in order to maintain orthodoxy. We are constantly in pursuit of the truth. Tension propels us into motion, rather than being solidified in our faith. Challenges and controversies in the Church bring to light a deeper understanding of the truth. “Jesus Christ is the same, yesterday, today, and forever” (Hebrews 13:8). Whatever age of the church on which we reflect, the problems were best resolved by the holiness unleased in the Body of Christ. Saints are the best answer to our crisis or any crisis. Our priests and deacons spent additional time discussing the present crisis in our church. We had frank discussions and question and answer sessions about how this crisis impacts us personally, how it painfully affects our local church and the church universal, and what we are called to do in response. I am so grateful to God for our priests and deacons presently serving in our diocese! They are men of faith and action serving with the heart of Jesus the Good Shepherd.